This past weekend I got to dust off my professional-lady clothes and attend WordCamp Omaha. In an extra small nutshell (pistachio, maybe? ), WordCamp is a conference for users and developers of WordPress, which is the blogging platform that I use for this website. The cool thing about WordPress is that you can make a website that doesn’t even look like a blog if you don’t want it to, but it can be done all by yourself, if that’s something you’re into. It’s very freeing, and is an incredible platform. Being at a tech conference with a smartphone is just as awesome as I always imagined it to be. Attending Barcamp Omaha last year without a smartphone was still enjoyable, but getting to participate in the Twitter conversation while the conference was happening this year at Wordcamp definitely opened my eyes to what I was missing. I followed the conference hashtag, tweeted back and forth with other attendees, and experienced a higher level of conference participation than at any of my previous experiences. I need to give myself more credit. The thought of attending Wordcamp was initially very intimidating for me. From what I could glean online, it looked like a giant tech conference full of people talking in a scary code language that I would never be able to understand. Luckily, I powered through my feelings of insecurity and fell into a world that wasn’t as scary as my neurotic brain made it out to be. Almost all of the code I encountered was like a different language, but it looked like a language I could (and will) learn. It wasn’t all about code, either. I listened to presentations about building your business, marketing your business locally, and even blogging itself. I found that almost every presentation had information that was applicable to my business and blog, and that I genuinely understood most of what the presenters were saying. One cannot become successful on creativity and passion alone. Something that became glaringly obvious to me last weekend was that I’ve been relying too heavily on the beret-wearing, Shakespeare-loving, bongo-tapping creative person living in the right side of my brain. I suspect that this is the most important thing I learned at Wordcamp. This is the reason I left Barcamp last year feeling inadequate and put-out. All I could see were creative people surrounding me being passionate and successful. I didn’t see the tools they used, or how many times they had tried and failed, or how they built their businesses. All I saw were men and women being effortlessly hip and passionate, and it made me feel like I’d never get there. Wordcamp exposed me to people using actual tools and business models to build their businesses … to attendees learning from their mistakes and learning from each other. I need to ask people other than just my friends to look at my website and give me feedback. I need to learn about what works technically, as opposed to what just looks pretty and fun in my brain. Barcamp’s going to be different this year for me. I’m going to find a presentation in the Tech or Entrepreneur tracks to listen to, rather than just staying in the creative side all day. I’m going to look around me and acknowledge that not everybody is riding around on a magical unicorn of creativity, becoming successful overnight … regardless of whether or not it looks that way. Finally…where are all the ladies!? Wordcamp brought not only useful information, but also great opportunities to network. There were two “drink-and-mingle” events, and I was shocked at how devoid of women the parties were. Plenty of the almost 100 conference attendees were female, and yet I didn’t count more than 5 women at the Friday night meet-and-greet. There were more at the party Saturday night, but not a staggering amount. I’m not pointing fingers. The thought of swimming in a sea of super-smart tech dudes can be intimidating. When I walked up, realized that I knew no one at the meet-and-greet, and that I could count the number of ladies on one hand, I started to get embarrassingly sweaty. What happened, though? I ended up meeting a bunch of guys who were genuinely friendly and inviting, and more than willing to share the information they had stored in their brains. The ladies I did meet were awesome and refreshing, and I was so glad they were there. I’m sure there’s plenty of social commentary that could go on here… but that’s not what this post is about. What I want to say is that the connections I made at the conference were fantastic, regardless of gender, and that there is nothing to be scared of. 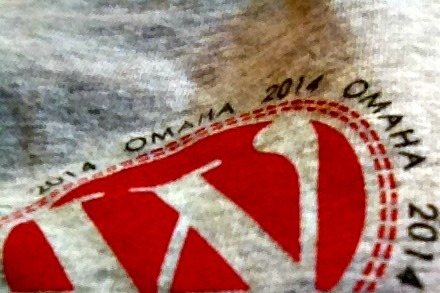 I’ll definitely be attending Wordcamp in 2015 if it returns to Omaha, and I’m planning to have used what I learned this year to be better prepared for the next.